Efficacy of the Touch of Guru’s Hand – Rama-Navami Festival – Its Origin, Transformation etc. Repairs to the Masjid. Where Real or Sad-Guru is the helmsman, he is sure to carry us safely and easily beyond the worldly ocean. The word Sadguru brings to mind Sai Baba. He appears to me, as if standing before me, and applying Udi (scared ashes) to my fore-head and placing his hand of blessing on my head. Then joy fills my heart and love overflows through my eyes. Wonderful is the power of the touch of Guru’s hand. The subtle-body (consisting of thoughts and desires), which cannot be burnt by the world dissolving fire, is destroyed by the mere touch of the Guru’s hand, and the sins of many past births are cleaned and washed away. Even the speech of those, whose heads feel annoyed when they hear religious and Godly talks, attains calmness. The seeing of Sai Baba’s handsome form, chokes our throat with joy, makes the eyes overflowing with tears, and overwhelms the heart with emotions. It awakens in us ‘I am He (Brahman)’ consciousness, manifests the joy of self-realization, and dissolving the distinction of I and Thou, then and there, makes us one with the Supreme (One Reality). When I begin to read scriptures, at every step I am reminded of my Sadguru, and Sai Baba, assumes the form of Rama or Krishna and makes me listen to his Life. For instance when I sit to listen to Bhagwat, Sai becomes Krishna from top to toe, and I think he sings the Bhagwat or Uddhava Gita (song of teachings by Lord Shri Krishna to His disciple, Uddhava) for the welfare of the devotees. When I begin to chitchat, I am at once put in mind of Sai’s stories for enabling me to give suitable illustrations. When I myself start to write anything, I cannot compose a few words or sentences, but when He of his own accord makes me write, I go on writing and writing and there is no end to it. When the disciple’s egoism props up, He presses it down with His hand, and giving him His own power, makes him gain His object, and thus satisfies and blesses him. If any one prostrates before Sai and surrenders heart and soul to Him, then unsolicited, all the chief objects of life viz. Dharma (righteousness), Artha (wealth), Kama (Desire) and Moksha (Deliverance), are easily and unsolicitedly attained. Four paths, viz., of Karma, Jnana, Yoga and Bhakti lead us separately to God. Of these, the path of Bhakti is thorny and full of pits and ditches, and thus difficult to traverse, but if you, relying on your Sadguru, avoid the pits and thorns and walk straight, it will take you to the destination (God). So says definitely, Sai Baba. One, Mr. Gopalrao Gund, was a Circle Inspector at Kopergaon. He was a great devotee of Baba. He had three wives, but had no issue. With Sai Baba’s blessings, a son was born to him. In the joy that he felt regarding the event, an idea of celebrating a fair or ‘Urus’ occurred to him in the year 1897, and he placed it for consideration before other Shirdi devotees, viz. Tatya Patil, Dada Kote Patil and Madhavrao Deshpande (Shama). They all approved of the idea, and got Sai Baba’s permission and blessings. Then an application for getting the Collector’s sanction for celebrating the urus was made, but as the village Kulkarni reported against holding the fair, the sanction was refused. But as Sai Baba had blessed it, they tried again, and ultimately succeeded in getting the Collector’s sanction. The day for the Urus was fixed on the Rama-Navami day, after having consultation with Sai Baba. It seems, He had some end in view, in this, viz., the Unification of the two fairs of festivals, the Urus and the Rama-Navami and the unification of the two communities – the Hindus and the Mahomedans. As future events showed, this end or object was achieved. Though the permission was obtained, but other difficulties cropped up. Shirdi was a village, and there was scarcity of water. There were two wells in the village, the one in use, dried up soon, and the water from the second was brackish. This brackish water was turned into sweet one by Sai Baba, by throwing flowers into it. The water of this well was insufficient, so Tatya Patil had to arrange to get water, from a well by fixing Moats (leather sacks) thereon, at a considerable distance. Then temporary shops had to be constructed, and wrestling bouts arranged. Gopalrao Gund had a friend, by name Damu Anna Kasar, of Ahmednagar. He also was similarly unhappy in the matter of progeny, though he married two wives. He too was blessed by Sai Baba with sons, and Mr. Gund prevailed upon his friend to prepare and supply one simple flag for the procession of the fair; he also succeeded in inducing Mr. Nanasaheb Nimonkar to supply another embroidered flag. Both these flags were taken in procession through the village, and finally fixed at the two ends or corners of the Masjid, which is called by Sai Baba as Dwarkamai. This is being done even now. There was another procession which was started in this fair. This idea of ‘Sandal’ procession originated with one Mr. Amir Shakkar Dalal, a Mahomedan Bhakta from Korhla. This procession is held in honour of great Muslim Saints. Sandal i.e. Chandan paste and scrappings are put in the THALI (flat dishes), and these are carried with incense burning before them in procession to the accompaniment of band and music through the village and then after returning to the Masjid, the contents of the dishes are thrown on the ‘Nimbar’ (nitche) and walls of the Masjid with hands. This work was managed by Mr. Amir Shakkar for the first three years, and then afterwards by his wife. So on one day, the two processions, the ‘Flags’ by the Hindus and that of ‘Sandal’ by the Muslims, went on side by side, and are still going on without any hitch. Things were going on in this way and the fair was gradually increasing in importance till 1912 A.D., when a change took place; That year one devotee, Mr. Krishnarao Jageshwar Bhisma (the author of the pamphlet ‘Sai Sagunopasana’), came for the fair with Dadasaheb Khaparde of Amraoti, and was staying on the previous day in the Dixit Wada. While he was lying on the verandah, and while Mr. Laxmanrao alias Kaka Mahajani, was going down with Puja materials to the Masjid, a new thought arose in his mind and he accosted the latter thus – There is some providential arrangement in the fact that the Urus or fair is celebrated in Shirdi on the Rama-Navami day; this day is very dear to all the Hindus; then why not begin the Rama-Navami Festival – the celebration of the birth of Shri Rama here on this day? Kaka Mahajani liked the idea, and it was arranged to get Baba’s permission in this matter. The main difficulty was how to secure a Haridas, who would perform ‘Kirtan’ and sing the glories of the Lord on the occasion. But Bhishma solved the difficulty, by saying that his ‘Rama Akhyan’ (composition on Rama’s birth) was ready, and he would do the ‘Kirtan’ himself, while Kaka Mahajani should play on the harmonium. It was also arranged to get the ‘Sunthavada’ (ginger-powder mixed with sugar) as Prasad prepared by Radha-Krishna Mai. So they immediately went to the Masjid to get Baba’s permission. Baba, who knew all things and what was passing there, asked Mahajani, as to what was going on in the Wada. Being rather perturbed, Mahajani could not catch the purport of the question and remained silent. Then Baba asked Bhishma, what he had to say. He explained the idea of celebrating Rama-Navami festival, and asked for Baba’s permission and Baba gladly gave it. All rejoiced and made preparations for the Jayanti-festival. Next day, the Masjid was decorated with buntings etc., a cradle was supplied by Radha-Krishna Mai, and placed in front of Baba’s seat and the proceedings started. Bhishma stood up for Kirtan and Mahajani played on the harmonium. 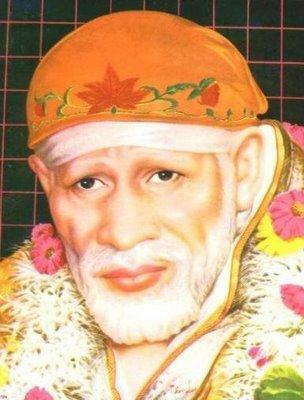 Sai Baba sent a man to call Mahajani. He was hesitating to go, doubting whether Baba would allow the festival to go on; but when he went to Baba, the latter asked him as to what was going on and why the cradle was placed there. He answered that the Rama-Navami festival had commenced, and the cradle was put on for that purpose. Then Baba took a garland from the ‘Nimbar’ (nitche), and placed it round his neck and sent another garland for Bhishma. Then commenced the Kirtan. When it came to a close, pound sounds of “Victory to Rama” went up; and Gulal (red – powder) was thrown up all round, amidst band and music. Everybody was overjoyed, when suddenly roaring was heard. The red-powder thrown promiscuously all round, went up, somehow entered Baba’s eyes. Baba got wild and began to scold and abuse loudly. People got frightened by this scene and took to their heels. Those intimate devotees, who knew Baba well, took these scoldings and outpourings of Baba, as blessings in disguise. They thought that when Rama was born, it was proper for Baba to get wild and enraged to kill Ravana; and his demons, in the form of egoism and wicked thoughts etc. Besides they knew, that whenever a new thing was undertaken at Shirdi, it was usual with Baba to get wild and angry, and so they kept quiet. Radha-Krishna Mai was rather afraid; and thought that Baba might break her cradle, and she asked Mahajani to get the cradle back. When he went to loosen and unfasten the cradle, Baba went to him, and asked him not to remove it. Then after some time, Baba became calm, and that day’s programme, including Mahapuja and Arati was finished. Later on, Mr. Mahajani asked Baba, for permission to remove the cradle, Baba refused the same saying, that the festival was not yet finished. Next day, another ‘Kirtan’ and Gopal-Kala ceremony (an earthern pot containing parched rice mixed with curds is hung, only to be broken after the ‘Kirtan’, and the contents distributed to all, as was done by Lord Kri shna amongst His cow-herd (friends), were performed, and then Baba allowed the cradle to be removed. While the Rama-Navami festival was thus going on, the procession, of the two flags by day and that of the ‘Sandal’ by night, went off with the usual pomp and show. From this time onwards, the ‘Urus of Baba’ was transformed into the Rama-Navami festival. From next year (1913), the items in the programme of Rama-Navami began to increase. Radha-Krishna Mai started a ‘Nama-Saptah’ (singing the glory of God’s name continuously day and night for seven days), from 1st of Chaitra, For this, all devotees took part by turns, and she also joined it, sometimes early in the morning. As Rama-Navami Festival is celebrated in many places all over the country, the difficulty of getting a Haridas was felt again. But 5 or 6 days before the festival , Mahajani met accidentally Balabuva Mali, who was known as modern Tukaram, and got him to do the ‘Kirtan’ that year. The next year (1914), another Balabuva Satarkar of Brihadsiddha Kavate, District Satara, could not act as a Haridas in his own town, as plague was prevailing in his town, and so he came to Shirdi; With Baba’s permission, which was secured through Kakasaheb Dixit, he did the Kirtan; and was sufficiently recompensed for his labour. The difficulty of getting a new Haridas every year was finally solved from 1914 by Sai Baba, as He entrusted this function to Das Ganu Maharaj permanently, and since that time, he has been successfully and creditably conducting that function uptill now. Since 1912, this festival began to grow gradually year by year. From the 8th to 12th of Chaitra, Shirdi looked like a bee-hive of men. Shops began to increase. Celebrated wrestlers took part in wrestling bouts. Feeding of the poor was done on a grander scale. Hard work and sincere efforts of Radha-Krishna Mai turned Shirdi into a Sansthan (State). Paraphernalia increased. A beautiful horse, a palanquin, chariot and many silver things, pots, buckets, pictures, mirrors etc. were presented. Elephants were also sent for the procession. Though all this paraphernalia increased enormously, Sai Baba ignored all these things, and maintained His simplicity as before. It is to be noted that both the Hindus and Mahomedans have been working in unison in both the processions, and during the entire festival, there has been no hitch or quarrel between them at all so far. First about 5000-7000 people used to collect, but that figure went up to 75000 in some years; still there was no outbreak of any epidemic or any riots w orth the name during so many past years. Another important idea occured to Gopal Gund. Just as he started the Urus or fair, he thought that he should put the Masjid in order. So in order to carry out the repairs, he collected stones and got them dressed. But this work was not assigned to him. This was reserved for Nanasaheb Chandorkar, and the pavement -work for Kakasaheb Dixit. First, Baba was unwilling to allow them to have these works done, but with the intervention of Mhalsapati, a local devotee of Baba, His permission was secured. When the pavement was completed in one night in the Masjid, Baba took a small Gadi for His seat, discarding the usual piece of sack – cloth used till then. In 1911, the Sabha – Mandap (court – yard) was also put in order with great labour and effort. The open space in front of the Masjid was very small and inconvenient. Kakasaheb Dixit wanted to extend it and put on it a roofing. At great expense, he got iron-posts, and pillars and trusses and started the work. At night, all the devotees worked hard and fixed the posts; but Baba, when he returned from Chavadi next morning, uprooted them all and threw them out. Once it so happened that Baba got very excited, caught a pole with one hand, and began to shake and uproot it, and with the other hand caught the neck of Tatya Patil. He took by force Tatya’s Pheta, struck a match, set it on fire and threw it in a pit. At that time, Baba’s eyes flashed like burning embers. None dared to look at Him. All got terribly frightened. Baba took out a rupee from his pocket and threw it there, as if it were an offering on an auspicious occasion. Tatya also was much frightened. None knew what was going to happen to Tatya, and none dared to interfere. Bhagoji Shinde, the leper devotee of Baba, made a little boldly advance, but he was pushed out by Baba. Madhavrao was also similarly treated, he being pelted with brick pieces. So all those, who went to intercede, were similarly dealt with. But after some time, Baba’s anger cooled down. He sent for a shopkeeper, got from him an embroidered Pheta and Himself tied it on Tatya’s head, as if he was being given a special honour. All the people were wonderstruck to see this strange behavior of Baba. They were at a loss to know, what enraged Baba so suddenly and what led Him to assault Tatya Patil, and why His anger cooled down, the next moment. Baba was sometimes very calm and quiet and talked sweet things with love, but soon after, with or without any pretext, got enraged. Many such incidents may be related; but I do not know which to choose and which to omit. I, therefore, refer them as they occur to me. Bless us all sainath.Jai Sairam. Thank u In Sai Ram for blessing me with all the happiness, joy and prosperity.Om Sai Ram. please bless us with peace and prosperity. Jaya Hanuman – This webpage has already contributed happiness to my heart and soul. Sing out the praises of Lord Ramachandra. Om Sairam…Sri Sachithananda Sadguru Sainath Maharaj ki Jai…. Samardha Sadguru Sai please bless me with good life..
Lu­fm:InÃelizsente concordo consigo. A necessidade dessas medidas nÃ£o Ã© reconhecida por muitas pessoas, a comeÃ§ar por professores. Tinha esperanÃ§a que o Nuno Crato conseguisse mudar este estado de coisas, mas ele dÃ¡ uma no cravo e outra na ferradura. Nolween, new books rock! Digital expression is for Photoshop Elements but Elements is a lighter version of “real” Photoshop so I’m sure if you have the suit you could do everything that can be done in Elements. 🙂 I haven’t started reading it yet, but I want to explore digital collage a bit this autumn/winter. Mudah saja.Green tea increases the metabolism. The polyphenol found in green tea works to intensify levels of fat oxidation and the rate at which your body turns food into calories.haa,lebih kurang begitula ceritenye.. +6Was this answer helpful? Intersting post and site. Excellent that Google listed so i was able to get here. This website will go no in my bookmarks from now. Several things i have seen in terms of laptop or computer memory is that often you can find capabilities such as SDRAM, DDR etc, that should fit in with the specs of the mother board. If the private computerâ€™s motherboard is reasonably current whilst you’ll find no operating-system issues, improving the memory literally will take under a couple of hours. It is one of the easiest computer upgrade types of procedures one can envision. Thanks for sharing your suggestions. Hello there! I could have sworn Iâ€™ve been to this weblog before but right after checking by means of some with the post I realized itâ€™s new to me. Anyhow, Iâ€™m undoubtedly glad I located it and Iâ€™ll be bookmarking and checking back frequently! Howdy! I know this really is kinda off subject but I’d figured I’d ask. Would you be enthusiastic about exchanging links or perhaps guest authoring a blog post or vice-versa? My webpage addresses many the same subjects as yours and I believe we could drastically benefit from each other. For anyone who is interested really feel cost-free to shoot me an e-mail. I appear forward to hearing from you! Superb weblog from the way! Shri Sai Satcharitra (English) Chapter 6 - RAMA-NAVAMI FESTIVAL AND MASJID REPAIRS Efficacy of the Touch of Guru’s Hand - Rama-Navami Festival - Its Origin, Transformation etc. Repairs to the Masjid.